Bellefonte and Penn State Altoona graduate Ethan Stewart-Smith is turning around the men’s basketball program at William & Jefferson College as the team’s head coach. 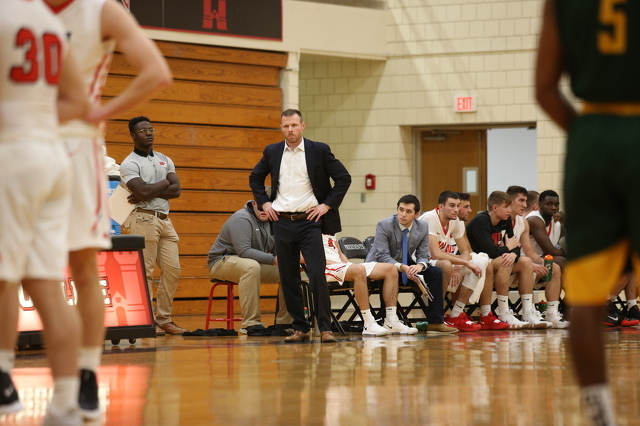 Washington & Jefferson College basketball has improved each year since the head coaching job was given to Ethan Stewart-Smith, and though his fourth season at the helm nears its end, the team’s growth is just getting started. Stewart-Smith graduated from Bellefonte Area High School and studied at Penn State Altoona. While a Nittany Lion, he started all four years on the basketball team and made a name for himself, being named an all-conference selection his junior year. Stewart-Smith’s name was also placed in the record books at Altoona, where he held the all-time steals and assists records at the time of his graduation and still places near the top of several career statistics. After graduating in 2007 with a degree in business with a focus in marketing and management, Stewart-Smith worked in sales for the Altoona Curve and State College Spikes. He eventually realized that he wasn’t enjoying himself, and was looking for another job. Stewart-Smith’s coaching career started almost without him intending it to. In the two years since he graduated, he had kept in contact with his coach during senior year at Altoona, Alan Seretti. It happened that Seretti had just accepted the head coaching job at Dickenson College and was looking for an assistant. He offered the job to his former player. Despite knowing very little about what exactly he was getting himself into, Stewart-Smith jumped at the opportunity. “I accepted, kind of sight unseen, without having a ton of information. I really loved the game, loved being around it, really trusted Coach Seretti,” said Stewart-Smith. “I ended up in Carlisle and fell in love with it, especially after that first year. After spending five seasons at Dickinson, Stewart-Smith spent a season as an assistant at Carnegie Mellon University for the 2014-15 season — the Tartans’ best season in several years. Stewart-Smith’s performance leading the team’s defense got Washington & Jefferson’s attention. Late in Stewart-Smith’s first season at Washington & Jefferson, of Washington, PA, his team had only six players. Stewart-Smith knew that building up the team from such a small roster would be difficult. Strategically, there isn’t much you can do with a roster barely large enough to man the court. “For me, it was really kind of laying our foundation from a competitive standpoint over everything,” said Stewart-Smith. Now that the size of his roster has nearly tripled, he is able to coach his W&J team the same way he played in college. “With being able to build our roster we’re able to play 10 guys consistently. When you have six guys, it’s more slow it down and control the game,” said Stewart-Smith. “As we’ve been able to add more pieces, we’ve been able to get to a much faster pace. That’s how I enjoyed playing the game. I think that’s how our guys enjoy playing and how I enjoy coaching. Each season since he took over the program, the Presidents have improved on the previous year’s record, possibly doubling the 2017-18 season’s five wins by the end of this current season. Washington & Jefferson has nine total PAC titles but hasn’t been to the Division-III tournament since the mid-’90s where it made it to the Elite Eight. At one point during the 2018-19 season, the Presidents were holding second place in the conference. Stewart-Smith believes his coaching philosophy will get his team there. “There’s a certain process that has got to take place with constant improvement and our personality as a team and as a program that we’re trying to build up to,” said Stewart-Smith. “That success is going to be a byproduct of our approach to steady improvement. Not everything that makes Stewart-Smith enjoy coaching comes from results on the court. “Just seeing growth is one of the most fun parts of (coaching),” said Stewart-Smith. “Just to be able to see (my players) grow up over their four years here, not only from a basketball standpoint, but from a maturity standpoint. It’s really rewarding to see them come in as immature kids and leave with jobs and being really good people that I know are going to go on to do great things in their communities.